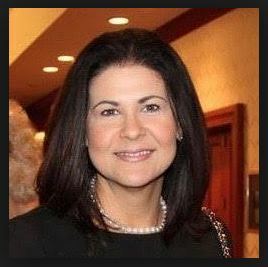 Join us at our April Meeting as we welcome Ada Briceño: OC Democratic Party Chair to discuss the mission of the Democratic Party in OC as we head into the 2020 election cycle. 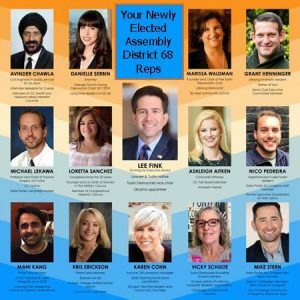 Electing a Democratic to the OC Board of Supervisors will make a HUGE difference to the lives of all OC residents – she will laser focus on issues that matter to OC Democrats: Jobs, the Environment, the Homelessness Crisis and Healthcare and Social Services. Plumbers Hall in Orange starting at 8:00! Your Polling Place MAY HAVE CHANGED!!! 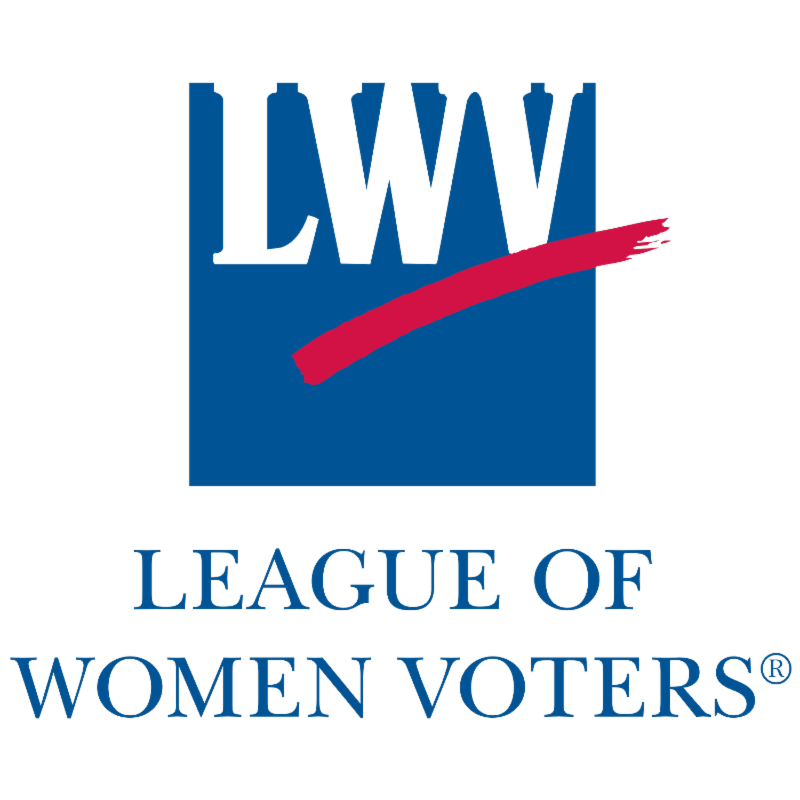 Click on THIS LINK to see where your polling place is for THIS election! EVERY VOTE COUNTS so make sure to vote on Tuesday March 12! Get Out The Vote for Loretta Sanchez! Next weekend is our LAST weekend before the March 12th election! We will be knocking on doors for all 4 days before the election – March 9 through March 12. Canvas For Loretta in TUSTIN: Your Door Knock Will Make A Difference!!! Thursday March 7 – THE LAST Phone Bank at Panera! In August of 2018, a Federal Court determined that cities and the County of Orange must provide housing for 60 percent of their total homeless counts based on 2017 statistics. Cities that fail to meet a February deadline cannot enforce anti-camping ordinances (i.e. the encampment last year behind the Library or at the Santa Ana riverbed) until they offer homeless people an alternative to the streets. The City of Tustin is responsible for producing at least 42 beds, the location of which has been the subject of much controversy. Join us on Tuesday as we address this important issue with Brooke Weitzman the lead attorney working with Federal Judge David O. Carter and recently named as “Most Influential 2018” by the OC Register. 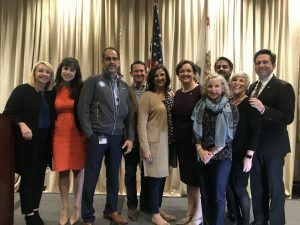 Date and time: TONIGHT Friday, February 15 at 7 p.m.
On January 22nd, Katie Porter took her Community Oath of Office at UCI in front of hundreds of Porter Supporters. Immediately afterwards, she hosted her first CA 45 Town Hall. A welcome change from the Mimi Walters years! Click HERE for more information about the January 22nd Town Hall. 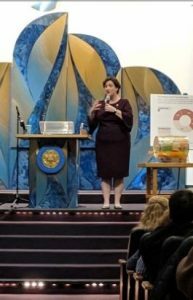 Click HERE to sign up for Katie Porter’s CA45 Newsletter and Email updates. 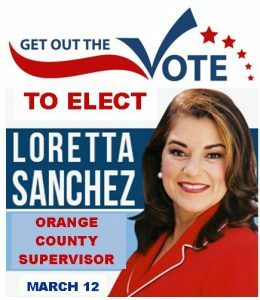 Loretta Sanchez For OC Supervisor! Help Build the Momentum For A Great Turn Out on March 12th! 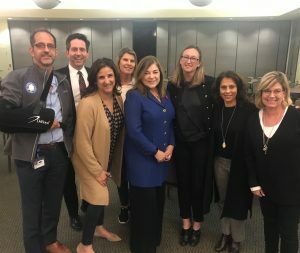 In January, The Tustin Democrats welcomed Loretta Sanchez to talk about her campaign for the OC Supervisor seat recently vacated by Todd Spitzer. 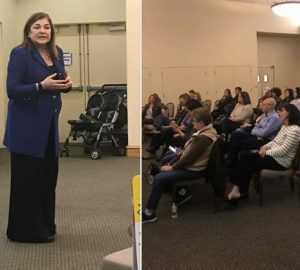 She told a packed meeting that she views the race as a chance to address regional problems, including housing affordability and homelessness. Ms. Sanchez is the sole Democrat running against 6 Republicans for the seat. 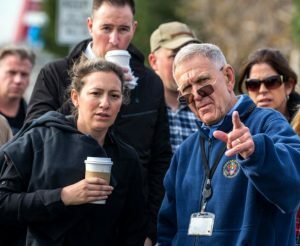 The Board of Supervisors is one of the most crucial positions in government – and an individual Supervisor is one of the most powerful elected officials in the country. The Board of Supervisors controls the County’s $6.4 Billion budget. And whereas a member of Congress needs to get 218 people to agree, and a state Senator needs to get 20 other people to agree with them, a Supervisor only needs to get 2 other people to agree with them. So they have immense power. The Board of Supervisors is responsible for County Parks, Social Services, the Registrar of voters, it oversees the Sheriff and Cal-Optima which provides Medicaid/Medi-Cal services, and sets direction and makes the critical appointments to that control the buses, sewers, sanitation, water, and fire services all throughout Orange County. In addition, in unincorporated areas (like North Tustin), the County does all the work of a municipal government, including planning and zoning, building and development, police protection, and trash, water, and sewers. Join us as we welcome Brooke Weitzman, named along with Federal Judge David O. Carter as “Most Influential 2018” by the OC Register. Ms. Weitzman is the lead attorney working with Judge Carter on the homelessness crisis in Orange County. Click HERE for December 30, 2018 article in the OC Register.